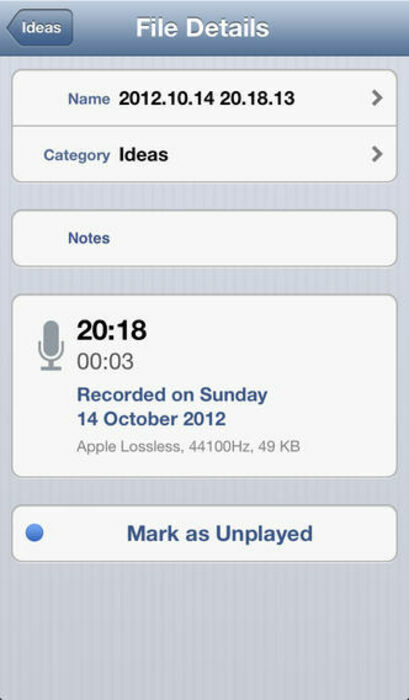 With YaRec you can quickly and easily record audio on your iPhone or iPod touch and organise your recordings into categories. • BUTTONS FREE RECORDING, You don't even have to press any buttons to make a recording. Simply place iPhone to your ear to start a recording and remove to automatically save it. • AUTO SPEAKER/EARPIECE PLAYBACK, YaRec will automatically select either the earpiece or speaker depending on whether you have the iphone placed to your ear or not. • VOICE ACTIVATED RECORDING, Set the threshold level to ignore background noise and then simply talk. It will record without missing a single millisecond. Can be turned on/off in settings. • DROPBOX UPLOAD (in app purchase), upload audio files directly to your Dropbox account. View Dropbox upload progress in the dedicated Dropbox Queue screen. Uploads continue in the background for supported devices. • Works with bluetooth headphones. • Stream audio to the latest Apple TV. • Live display of memory used and available memory. • Add, rename, delete categories. • Inbuilt web server to allow access to recordings using a browser (wifi only). • Record to any audio format supported by the iPhone. • Unread badge shows you how many recordings you haven't listened to yet. • Trash can allows you to recover deleted recordings. • Auto playback of recordings by placing the iPhone to your ear. • Play, pause, fast-forward and rewind. • iOS4 and above compatible, fully supports background recording and playing. • Use Apple headphones with remote to play/pause and to record/save, even when in the background (iPhone 4 only). Compatible with iPhone and iPod touch (with microphone). Requires iPhone OS 4.0 or later. Use latest dropbox sdk to fix issues with uploading large files. Add open in functionality to open audio files in supporting apps. Recording will pause on an incoming call and resume afterwards.